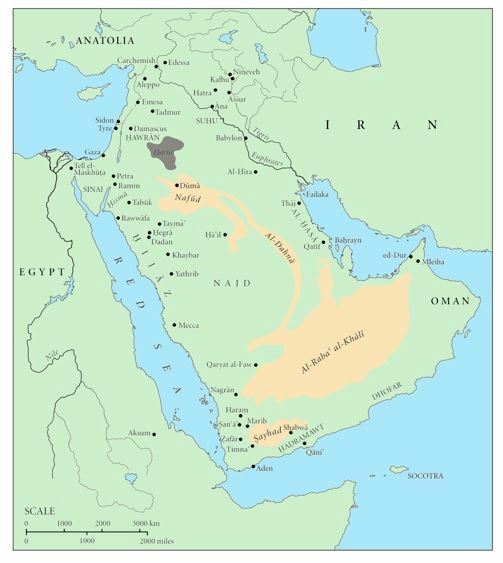 Arabia is a peninsula of Western Asia situated northeast of Africa on the Arabian plate. From a geographical perspective, it is considered a subcontinent of Asia. The most prominent feature of the peninsula is desert, but in the southwest there are mountain ranges, which receive greater rainfall than the rest of the Arabian Peninsula. Archaeology has revealed the existence of many civilizations in pre-Islamic Arabia ), especially in South Arabia (Arabia Felix). These civilizations include Sheba, Himyarite Kingdom, Kingdom of Awsan, Kingdom of Ma'īn and Sabaean Kingdom. To the north, Arabia Petraea was bordered on the north by Syria, on the west by Iudaea and Egypt. Arabia Petraea was made into a Roman province in 106 AD.